Odisha Plus 2 Results: The council of higher secondary education (CHSE) will release the results of the Odisha Plus II Arts and Commerce stream on Saturday, June 9, 2018 shortly after the day starts. 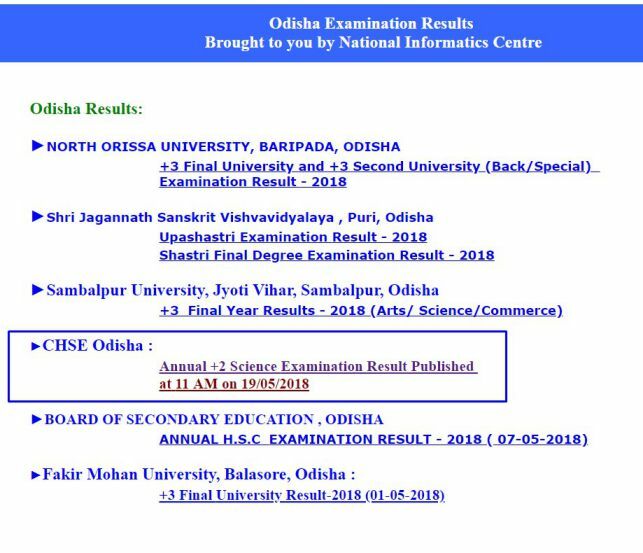 CHSE+2 results are expected to released after 10:30 AM today on the official website of education department (orissaresults.nic.in) and central results library- results.nic.in. The results for individual students are not available on chseodisha.nic.in – Please ignore fake news reports. As students are already aware of answer keys released by various institutes for Odisha Plus 2 Arts and Odisha Plus 2 Commerce, they might have already estimated a score range in examinations, the test would be of average marks scored out of desired. Education Minister Badri Narayan Patra will announce the results of Odisha Plus II Arts and Odisha Plus II Commerce along with the toppers and passing percentage at 10:30 AM Today. Vocational results are also expected to be released along with. After clearing the +2 examinations, students will be able to bid for a seat in the Odisha Plus 3 Admission list the process of which is expected to begin from June 12 onwards. Education minister will be releasing a result book at Council of Higher Secondary Education (CHSE) office in Bhubaneswar along with results, according to reports. A total 3,65,826 students appeared the plus two examination this year of whom around 2.2 lakh appeared the exam in arts stream and 27, 447 students appeared the exam in commerce stream. Along with the results of regular students, vocational classes results are also expected to be released this Saturday. Odisha Plus 2 Arts and Odisha Plus 2 Commerce results are coming bit late this year as last time they were declared on May 31, 2017. Bijay Kumar Sahoo, CHSE’s controller of examinations earlier confirmed that evaluation process is completed and now they are filling the data in computers for results availability around the world. . “Tabulation process of the marks is going on. After tabulation, we will announce the results,” said Sahoo. Science stream results are already available on the official website of board. The examinations of Odisha Plus 2 were organised between March 6 to March 29. More than 2.85 Lakh students are waiting for their results today.